One Sunday morning, February 19, 1911, Cecilia Georgene Tappa was born in Stiles, Wisconsin. She grew up in this small town about 25 miles north of Green Bay. Over time, the family grew to include one brother and six sisters. Ceil attended a one room grade school in Lakewood, Wisconsin. She relates that no matter which direction you walk in that area--there is a lake within one mile! While Ceil was a teenager, one of the neighbor children was hospitalized at St. Vincent Hospital in Green Bay. A Sister who was caring for this lad mentioned to the family that they were very short of help at the hospital. The family told Ceil’s mother of the opportunity for employment. After Mom talked to her, Ceil decided to go to work at the hospital in Green Bay. Jobs were not plentiful in Stiles so she was grateful for the chance to work and help her family. She worked directly with the patients for about four years. While she was at St. Vincent’s, Ceil lived with other young women at the girls’ home. She was able to observe the Sisters in their work setting as well as at the services she attended in the hospital chapel. Soon Ceil began to ponder the question: "Was the Lord calling her to a life as a Hospital Sister?" After giving this question serious consideration, Ceil determined the answer was "Yes" and entered the Community on October 2, 1930. She found traveling to Springfield, Illinois to be such a great distance from her family a difficult part of the decision. After completing the eight month postulancy, Ceil began the novitiate as Sister Georgene. She completed the intensive training required of novices and professed her religious vows on May 18, 1933. Soon she obtained her high school diploma and began studying to become one of the first dietitians in the Community. Following graduation from Fontbonne College in 1938, Sister Georgene spent one year as a dietetic intern at St. Mary’s Hospital in Rochester, Minnesota. Forty Years of Saying "Eat Your Vegetables!" 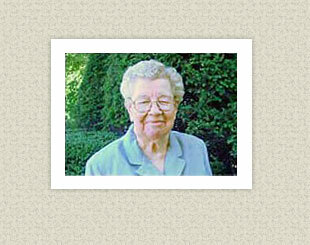 Sister Georgene served as a dietitian for over forty years. The aspect of Dietetics that she enjoyed most was teaching the patients good nutritional habits as well as the specifics of their special diets and supervising the employees in the Food Service Department. She had the opportunity to minister in various locations but spent many years at St. Nicholas Hospital in Sheboygan, Wisconsin. From 1969 to 1981, she was the Chief Dietitian as well as the Supervisor of Food Service for the hospital. When the rigors of this position became too great, Sister coordinated special projects for the Food Service Department for about ten years. From 1992 to 1996, she worked as a receptionist at the main desk of the hospital. Now Sister Georgene calls the Motherhouse her home. She lives in the retirement area but is not a "retiring" type person. She volunteers her time greeting visitors to the Motherhouse at the Convent Entrance several days each month. She participates in the many activities offered at the Motherhouse and maintains a full schedule of prayer, reading, and interacting with the other Sisters. Like the Energizer Bunny…"she keeps going and going!"